This is something that occurred to me while I was responding to a journal meme on deviantART. Back during the first Sister arc, Dan represented himself in the filler section using a female avatar. During Grace's birthday party the forum did something similar, with many members swapping their avatar's gender for the duration. And here we are, already into the third chapter of Sister 2, and we haven't switched anything. This forum needs more gender-changed avatars! I propose that we switch to an opposite gendered picture of whoever we're using as an avatar right now (or at least as close as one can get in some instances) for the duration of the storyline. As an added bit of silliness, I also propose that during this that participants put something in their sig to note their participation, and during Sister 2 call themselves and other participants by gender-swapped names (such as Elliot -> Elliette, or Chaos Priest -> Chaos Priestess). ... OK, so maybe that second one isn't the best idea. But I still wanna do it! On a somewhat related note, I don't suppose I could ask a favor of a decent colorist here, could I? I have an avatar I can use, but it's in black and white, and sad to say my coloring skills are poor. No way am I making Vault Girl. Sorry, but some things are sacred. that idea cheered me up, at least. so I'd be Ineluki, the storm*queen* now? Why let mere technicalities get in the way of things? Besides, since when have bunnies needed a reason for changing genders? I guess that would work. Maybe "Krgyxyka"? I'd be happy to colour your avatar for you. Just provide a link where I can download a full sized version (I assume the avatar you want colouring is the one you're using now, and it looks like it's been shrunk down to fit) and the colours you want using. Warning: Read this, and lose the game. I'm... not entirely sure what gender my avatar is. I don't know where it's from, I can't see any anatomical clues, and I just dunno. Still, I guess you can call me Kimber for the duration. You are in my Monkeysphere. Danm, I've got a gender neutral username. Current Avatar: Lea Plath the Anansi Mage. Location: Hiding in Amy Winehouses Beehive. My name is gender neutral anyway isn't it? Unless I wanted to go with Shadowmistress M... and that just sounds weird. A master can be male or female can't they? Location: Does anyone put their actual location here? theopenandclosedbook wrote: Danm, I've got a gender neutral username. Then I shall call you koondesolcdnanepoeht. I'm with Ineluki on the Shadowmaster F name. Ok I'll jump in. Ladies and gentlemen: Gatomon! I am Ghodicu of the nine gales. 1 random business card with the word WELCOME written on it in crayon. The M changes meaning depending on where I'm using it really. Here, I'm prety sure I've stated sometime or other that I was using the pseudonym 'Malus'. However, Shadowmaster F will work for this... anyone have any ideas on how to get a female pic of Magus or should I just change it to Chaos or something? I've been having trouble getting another avitar to work. It's either too big or a .bmp which apparently isn't allowed. If someone would like to share with me a Male Grace avitar that they are positive would work I'd be very happy to change mine. As for my name. Mine is also pretty gender neutral... any ideas on how to make it manly? *** Participating in the Gender-Swap Avitar fun! In light of having a gender neutral name I shall simply change my name like so: interestsmixed! It's swaped SEE??? Years of Bunny-ness: Over 2 Years! Seriously, I don't know how "Eques Concordia"'d be referred to gender-swapped. Concordius? mixedintrests wrote: I've been having trouble getting another avitar to work. It's either too big or a .bmp which apparently isn't allowed. If someone would like to share with me a Male Grace avitar that they are positive would work I'd be very happy to change mine. Well... I have no clue how to make Evil Grinning Cat look female so.... will an Evil Grinning Catalina do? Sanity, like all things, is best praticed in moderation. You could always go the easy route: just put a "m" in front of it; of course, then it sounds like your name is a stutter. Besides, isn't the point of a gender-neutral name to work for both genders anyways? Since everyone of you who is participating in this has it in your signature, modifying the name seems relatively superfluous. Chaos Priestess wrote: Back during the first Sister arc, Dan represented himself in the filler section using a female avatar. During Grace's birthday party the forum did something similar, with many members swapping their avatar's gender for the duration. And here we are, already into the third chapter of Sister 2, and we haven't switched anything. This forum needs more gender-changed avatars! Sounds good! My avatar is now of my female alter-ego, "Crystal the Cat". Feel free to call me that. I have a female avatar but am male should I get a male avatar then or keep scolding Nanase? Currently Nass for Sister II. 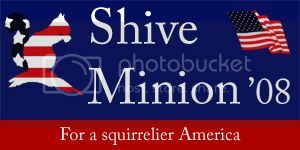 Vote Dan Shive for president of the united states! Who cares that he is too young to run! "Please tell me it has nothing to with your current lack of pants." The Slowly in Progress El Goonish GURPs feedback is appreciated by pm or posts. Location: Is that a demonic duck of some kind?